OB/GYN Specialists Providers Daniel P. McDonald, M.D. 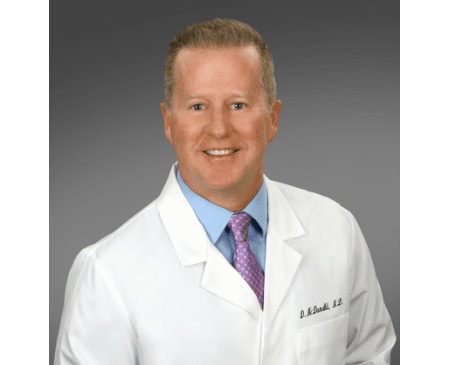 Daniel P. McDonald, MD, FACOG, is a board-certified OB/GYN dedicated to practicing medicine in line with the natural law, putting the dignity of each one of his patients above all else. He currently practices at OB/GYN Specialists in Denton, Texas. Dr. McDonald’s interest in becoming an OB/GYN began at the University of South Alabama College of Medicine, where he was a medical student. At the time, he never dreamed of becoming an OB/GYN, but he was completely overjoyed to witness the miracle of birth during his first delivery. Dr. McDonald was taken aback to see just how many women had been treated in an undignified manner by their doctors and vowed to offer his own patients the love, care, and compassion they deserved. That’s why Dr. McDonald is a pro-life OB/GYN, promising to recognize and respect the value of each human life from conception until death. In addition to his pro-life stance, Dr. McDonald is also an expert in the area of natural family planning methods, including Couple to Couple, Creighton, Marquette, and Billings. For many women, natural family planning methods can help prevent pregnancy and avoid the side effects of hormonal birth control. Dr. McDonald has been serving women around the Denton area for more than 14 years, helping new mothers through pregnancy, guiding them through natural birth control methods, and even specializing in miscarriage prevention. He's a member of the American Association of Pro-life OB/GYNs, the Society of Laparoscopic Surgeons, the American Association Gynecologic Laparoscopists, the Catholic Medical Association, and the Denton County Medical Society. When he is not at work, Dr. McDonald enjoys spending time with his wife of 20 years, Michelle, and their five children, Kate, Daniel, Michael, Allie, and Christina.